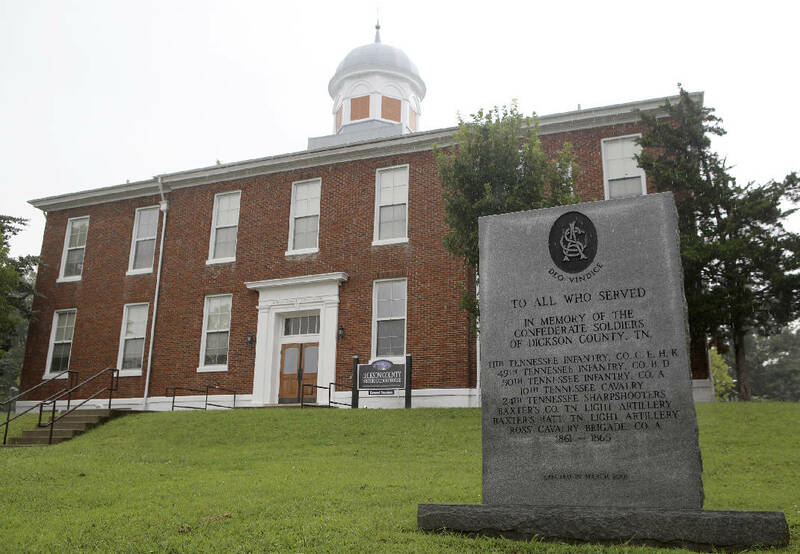 A monument "To All Who Served In Memory of the Confederate Soldiers of Dickson County" is seen in front of the Dickson County Historic Courthouse on Monday, Aug. 14, in Charlotte, Tenn.
CHARLOTTE, Tenn. — Nobody here seemed to think much about the Confederate monument when it went up on the courthouse lawn in 2001. Planted in the main square, the roughly 6-foot-tall tablet bore a message to this city of 5,862 people. "To all who served," reads the front. "In memory of the Confederate soldiers of Dickson County, Tenn."
But the back, which boasts an engraved image of the Confederate battle flag, has a Cleveland man considering requesting a change of venue for a charge he picked up during a protest against white nationalists in Dickson County. "It was strange, because when I went into the courthouse, I didn't notice any people of color working there," John Carico, 30, said of his first court appearance earlier this month. "And when we went back out afterwards, we saw these monuments, almost exclusively Confederate, and a lot of them were not old." A number of courthouses in Tennessee have Confederate symbols and monuments, said Carico's attorney, Robin Flores. Hamilton County, for instance, has a bust of Alexander P. Stewart, a Confederate lieutenant general, on its courthouse lawn. Though unveiled in 1919, when the Confederacy was glorified during the Jim Crow era, Stewart's presence is felt nearly a century later, as evidenced by Chattanooga's NAACP call last month to remove it. In Charlotte, Tenn., which is 95 percent white, according to 2010 census data, some community members said the Confederate monuments haven't caused any friction. "I don't think I've ever heard someone mention it, frankly," said defense attorney Olin Baker, whose law office is within eyeview of the monument. But given the events of Charlottesville, Va. — where 20-year-old James Alex Fields Jr. was charged with second-degree murder after driving his car into a crowd of counter-protesters, killing one — the nationwide debate over removing Confederate images, and the circumstances of his arrest, Carico and his allies wonder if he'll receive a fair proceeding. "I don't know that we've officially decided to move for a change of venue," said Beth Foster, a co-director for Chattanooga's Mercy Junction and Peace Center who also saw the monument. "But I think our reason would be, 'How can we expect a fair hearing in a courthouse where the defendant [Carico] has been attacked by a white supremacist and there's government-sanctioned white supremacist propaganda on the lawn?'" Ray Crouch Jr., 23rd Judicial District Attorney, who serves Cheatham, Dickson, Houston, Humphreys and Stewart counties, could not be reached for comment Tuesday. But other community members vouched for Charlotte's fairness. "I would dismiss that motion [to change venue] because in Dickson County you've got outstanding judges," said Allen Johnson, 74, a former attorney who is black. Cooper: Is there an end to sanitizing? Confederate monuments removed or vandalized across the U.S.
Greeson: Can we draw a line in the sand or water? Johnson, who also served as a city council member for the neighboring town of White Bluff, said he once sided against adding a Confederate soldier's name on a monument because the man did criminal things. But on the whole, he said, properly dedicated monuments have value in a country embroiled over issues of race and equality. "As long as the statute is there, I can say these are the guys who caused the problem," Johnson said. "And how do you discuss the history and understand where we're at with race in this country when the reminders are gone?" The debate over whether such monuments represent racism or heritage reignited in the aftermath of the 2015 massacre of nine black parishioners at a South Carolina church by Dylann Roof, an avowed racist who posed with Confederate flags in photos. Self-proclaimed fascists and white nationalists marched on Charlottesville after the city followed the example of other communities nationwide and made plans to remove a monument. Carico and 35-year-old Renee Hall, both of the Chattanooga area, witnessed some of the attacks at Charlottesville last weekend. Hall, a nurse at CHI Memorial hospital, received 12 stitches after she was hit in the forehead by a marcher's shield. She said she was part of a line that attempted to block white nationalists from marching past a church being used to shelter vulnerable or injured residents. During the same surge, marchers stomped on Carico's legs and shoulders, he said. "Some people just live this life, that's their life all the time," Hall said of people targeted by white nationalists. "As people of privilege, we need to step up to the plate." A few weeks before the Charlottesville incident, Carico was arrested for fighting with someone who attended the American Renaissance conference at Montgomery Bell State Park in Dickson County. Created by Jared Taylor in 1990, American Renaissance is a former-magazine-turned website that espouses "white identity." It's been flagged by the Southern Poverty Law Center for promoting pseudo-science studies that purport to show the inferiority of blacks to whites. In addition to 300 conference attendees, Carico said he was among 150 members who showed up July 29 to protest the conference making its home in Tennessee. Court records show Carico was yelling outside a nearby hotel room to William Markley III. The two started fighting when "Markley exited his porch," according to an affidavit of complaint. Both were charged with disorderly conduct, made $1,000 bonds and have separate court dates in September and November. Though Carico claimed self-defense, attorney Flores said the charges could be upgraded to aggravated assault since Markley had to be transported to a hospital. Markley's listed attorney, Kelly Jackson Smith, of Dickson, could not be reached for comment. On Taylor's website, the American Renaissance linked to a medical and legal fund for Markley, which claimed witnesses saw three to four counterprotesters punch, kick and Tase Markley "before appearing" to hold him underwater in a nearby lake. Several counterprotesters were arrested, the post claims. So far, $2,900 has been raised. Flores said Tuesday some of that information is true, but he could not comment any further. In a video online, Carico is belly down, handcuffed, and being searched by park rangers while a woman yells in the background that authorities need to arrest a different man in a blue shirt. "He Tased our friend," she shouts.